This spotlight post is the second article from Alan Armstrong showcasing his creative work using CityEngine to build 3D models that re-create ancient city environments. His work received deserving recognition among other great works of mapping and cartography submitted for consideration during the plenary at the Fed UC last week. Hello again. I am back with another CityEngine project to show and discuss with you over what modern technology is doing for ancient times. To shed some light on the nature of what I did, it was built as part of a larger project consisting of travel around the Mediterranean in 500CE involving cost-distance analysis between different cities. I decided to build Constantinople in CityEngine to provide the project with a 3D aspect to demonstrate what modern GIS and geomatics capabilities can do for the study of Antiquity. In regards to the building process, this took around as long to build as my previous reconstruction of Palmyra, if not a little longer due to the extensive texturing required. Yet it was made much more efficiently due to already knowing how the program works and the new circle polygon tool that I put to good use, along with mass texturing using CTRL + C. I was extremely glad to see how it turned out in the end, but I am of course also able to see where it can be improved and further implemented for future and other work that is not mine. For example, with the VR capability of CityEngine, the city can be refined and used in a VR space for people to fully explore the city as it was 1,500 years ago. With how I felt about what I had built, I decided to export it into the world of GIS. Esri hosted their 2019 FedGIS conference last week. A couple weeks beforehand, they put out a call to their user community to submit projects that they have been working on to demonstrate the range of their work. In hearing about this, I went about putting a new finish on my Constantinople city that was originally completed this past December. This 3D reconstruction was built from the e-ground up, and is what I submitted for Esri’s community call for their conference. Not knowing if my project would be selected or not, I submitted and began waiting for the conference to happen and see for myself. Since I am currently in Ottawa, Canada, I did not attend the conference, and had to see what happened by way of the videos that Esri released on their Youtube channel. I watched their opening address video and was coloured impressed to see all of the projects and their respective scopes of this community. Then came the 11:00 minute mark to see and realize that my Constantinople project was not only selected and used in the ‘Mapping and Cartography’ section of the address, but also briefly discussed by Jack Dangermond as well. This was truly exciting for me to see and hear about my work, and helps in my ongoing journey in the GIS world. 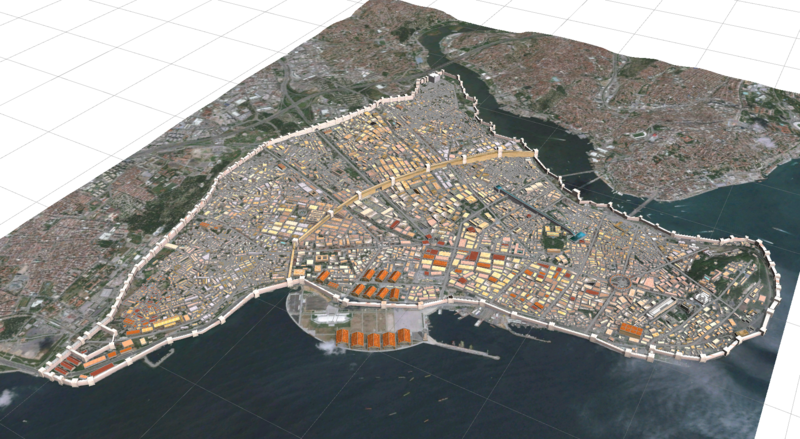 From here, I am currently building Athens circa 431BCE as part of another project using CityEngine, and will just have to wait and see what else I can do with it afterwards. With that, thank you for reading, and happy GISing everyone!